Solve accurate simulations quickly with COMSOL Multiphysics® and HPC. COMSOL is a fast-growing company with over 450 employees and offices in numerous countries around the world. We are dedicated to helping our customers achieve their simulation and modeling goals by offering flexible and intuitive software. With the COMSOL Multiphysics® software, users in a variety of industries and academia are developing innovative products and processes. The COMSOL® software uses advanced numerical methods that enable you to study almost any physics-based problem imaginable, providing you with solutions that account for coupled, multiple physics. We also offer over 30 add-on products that are designed to fit your specific simulation needs, including tools for modeling mechanical, chemical, electrical, and fluid flow applications. The inherent flexibility of our software can be expanded by building customized easy-to-use applications that are based on your models and simulations. You can then easily deploy these apps to colleagues and customers using the COMSOL Server™ license, effectively spreading the advantages of simulation. When running simulations, you can improve your efficiency by harnessing the HPC capabilities supported by COMSOL Multiphysics®. You can solve complicated memory-intensive models and save time when running large simulations, allowing you to quickly move on to your next project. To learn more about what we have to offer, please contact us. If your workstation does not have enough memory to solve large models or you want to solve simulations more quickly, then you can turn to the HPC capabilities supported by the COMSOL Multiphysics® software for help. Using the powerful components provided in today's high-efficiency high-performance computing, such as Intel's Omni-Path Architecture, you can achieve simulation results more rapidly and solve problems requiring high amounts of memory. COMSOL Multiphysics® supports different approaches to HPC hardware setups, including shared and distribution memory computing as well as the combination of the two: hybrid computing. With these capabilities, you can achieve high performance on parallel platforms. 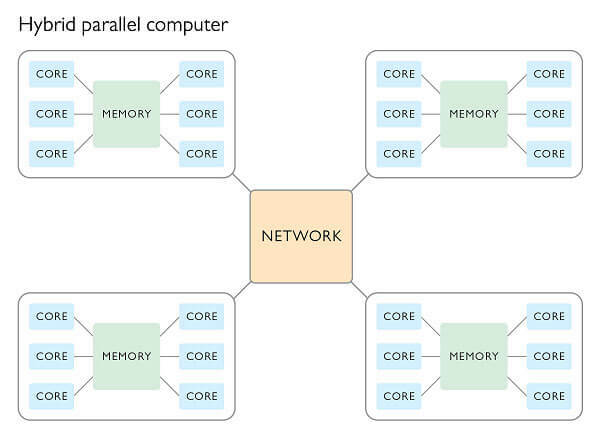 Visualization of hybrid parallel computing, combining both shared-memory and distributed modeling computing.